Display decorative accessories that show off your individual character and the things you love with this casual rustic occasional table. 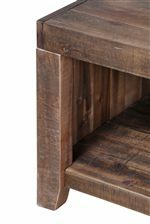 The chairside table displays simple lines that show off the distressed wood finish, a light, grayish shade popular with industrial and rustic decor styles. Table also boasts one cabinet with Gun Metal hardware and one open display shelf. The Caitlyn Rustic Rectangular Chairside Table with One Door and One Shelf by Magnussen Home at AHFA in the area. Product availability may vary. Contact us for the most current availability on this product.